The machining mill is one of the first polycraft inventories that can be crafted after mining polycraft ores. The machining mill is used to create metal molds and metal dies that can be used in the injection molder and the extruder to manufacture new polycraft items. The machining mill requires a bucket of water for operation to keep the cutting surfaces cool, but the water is not used up. It is difficult to automate a machining mill at this point, because pipes, hoppers and tree taps extract the metal from the inventory. A future release will look to add a computer aided machining mill to be able to create molds in a more efficient way. Note, metal molds and metal dies can be made from any number of metals ingots. Molds are used in the injection molder and dies are used in the extruder. Molds adn dies take a certain amount of damage per use depending on the material used to make the mold. Different molds have different maximum damage values, and the default value is 8192. Thus a metal that is damaged 128 per use will last 64 uses. Metal Ingots that cannot be used to make molds include Copper, Zinc, Palladium, Silver, Plumbum (Lead), Tin, and Chromite. Examples of molds that can be made are shown below. 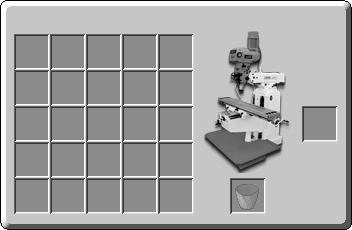 The machining mill was one of the first Polycraft inventories to make it into the game. It is essential to be able to build molds for the injection molder and the extruder to better refine and process materials. This page was last modified on 28 August 2018, at 02:15. This page has been accessed 27,179 times.